I recently entered a contest through the TCM Backlot and won tickets to see Dr. Strangelove (1964) today, as part of the TCM Big Screen Classics series that Turner Classic Movies hosts with Fathom Events. I hadn't seen the movie since TCM aired it in 2004 as part of an election-season series where a handful of politicians joined Robert Osborne to discuss their favorite films. I remember liking it, but I was 17 at the time and I'm not sure I fully grasped the humor or the message. Watching it now, with a fully-formed appreciation for dark humor and a better understanding of the perils of a nuclear-armed world, it felt more like an immersive experience than a simple night at the movies. The movie was book-ended by clips of Ben Mankiewicz sharing some behind-the-scenes details, just like on TCM. He mentioned that the whole cast got a kick out of Peter Sellers, and apparently George C. Scott said that he felt guilty for accepting payment for his role because he had such a great time on the set that it felt like robbery to take the money! I wasn't surprised to hear this, because in the closing scenes I happened to notice Peter Bull, who plays the Russian ambassador, trying *so* hard to maintain his stern composure while Peter Sellers performed his Alien/Nazi-hand-syndrome routine in the foreground. The movie definitely makes you laugh (the scene with the pay phone is priceless, and who can forget the film's most famous line, "Gentlemen. You can't fight in here! This is the War Room!") but watching a film in which paranoid, delusional leaders threaten the fate of the entire planet kind of hits a little close to home nowadays. I am opposed to a Trump presidency for many reasons, a major one being the notion that a man who doesn't even have the temperament for twitter could be in charge of our nuclear codes. Someone who wouldn't rule out the possibility of a nuclear attack on Europe. By the end of this movie -- the cowboy riding the nuclear warhead onto its Russian target, the crazed Nazi scientist unfazed by nuclear annihilation, the images of Earth being wiped out by the Doomsday Machine while Vera Lynn's voice reminds us "We'll Meet Again" -- I was silently weeping in my seat. 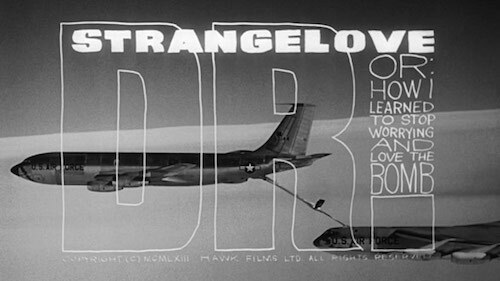 It's hard to write a post about Dr. Strangelove and not draw the comparisons. I kind of feel like even if you're a Trump supporter you would have to see some similarities between him and General Ripper or General Turgidson, right? Maybe you would see them as the heroes of the story? Sometimes I really wish I could watch movies like this -- ones that clearly have a political message with (in my opinion) a pretty black and white notion of who's the good guy and who's the bad guy -- through different eyes. Do you see what I see if your opinions aren't informed by the same political ideology? Do conservatives and liberals walk away from Meet John Doe, Mr. Deeds Goes to Town, or 12 Angry Men with the same message? Are we even seeing the same story? I'm honestly curious. 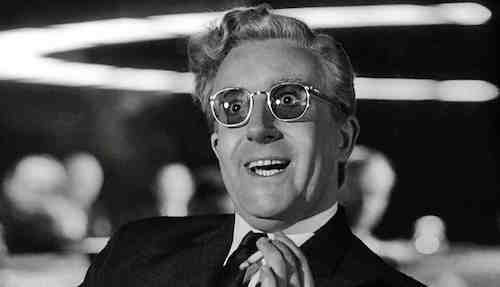 As a liberal, the takeaway that I got from Dr. Strangelove was one of anti-militarization. Signs around the army base proclaim "Peace is our Profession" while inside General Ripper is calling for an unprovoked nuclear airstrike against Russia. Neither side (save for a few paranoid individuals) actually wants war. None of us do, right? We all want our lives to go on peacefully, we want to love our families and eat good food and read good books. I don't want anybody to be blown to smithereens. I can't even fathom wanting that. And, to me, this film drives home that point. Only the delusional characters actually want war. Everyone else just wants things to remain calm and quiet. For them, peace really IS their profession. Another message that I personally took away from Dr. Strangelove was that of human fallibility. No matter how many fail-safes we build into our weapons, no matter how high the chain of command before something like a nuclear attack could occur, humans are fallible. It's crazy to have weapons that could destroy the planet many-times-over resting in our stupid, stupid hands. Furthermore, the answer to human fallibility is not mechanical infallibility. The Doomsday Machine was created as way to combat human error, but in the end it's a combination of human fallibility and mechanical infallibility that seals the fate of our planet. Wow, hadn't thought about how hard it would be to watch this film these days when I saw that it was coming back to theaters. I like how you tie it all together.